I hope that 2018 is full of strength and love and wonder. Going into this year, I am pondering the power of habits. 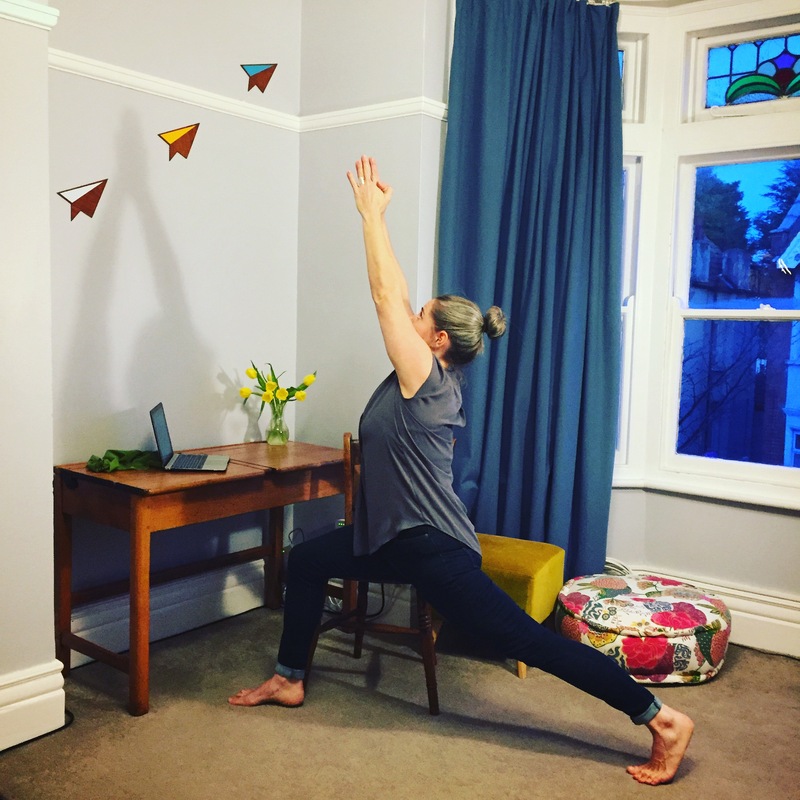 It is the little things we do every day that make the big changes happen… and it seems that one of the most potent habits we can have in developing strength (inside and out) is to move our bodies more every day. 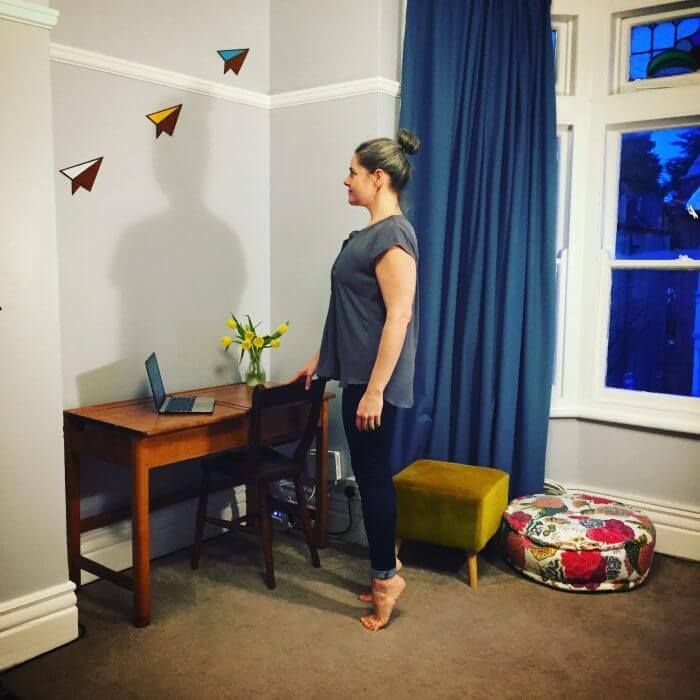 For many of us, January means diving into a lot of time at the computer, so I put together a few strength exercises that can flow together as a little 2 minute ‘moving break’ when I feel like I’ve been sat for too long at my desk. Maybe you want to give it a try too? 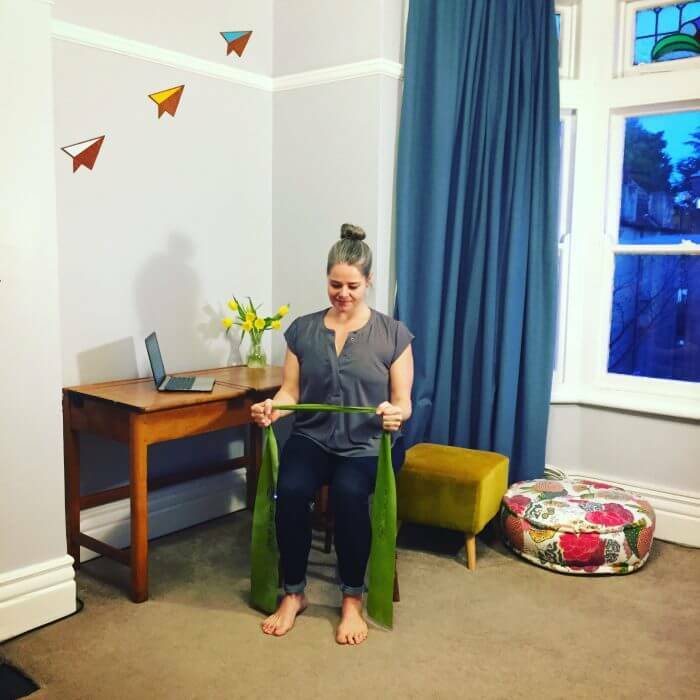 Every hour or so of static work, try taking 2 minutes to activate your stabilising muscles, energise your posture and breathe more deeply. Make it a habit – the actual exercises aren’t as important as just making space to move our bodies more. I hope this will help you to power through the rest of that to do list with a smile, bring you back to the present and help you to reconnect the head with the rest of your body. Yawn and Stretch: perhaps stand up and bounce a little to get the blood flowing and delivering the fresh oxygen around your body. 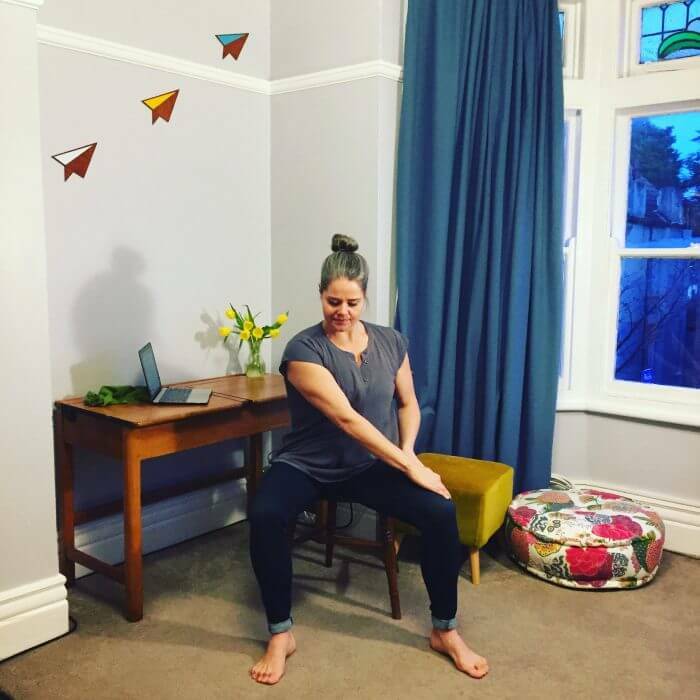 Seated glute stretch: Sitting in your chair, flex one foot (keep it flexed to protect the knee) and cross the ankle on top of the opposite knee. Play with how much you lean forward to find a stretch in your glutes. Seated glute activation: using resistance from your hands (or even better a resistance band around the thighs) open the legs to the side. This is to activate the glutes, a major support muscle that can become inactive from too much sitting. 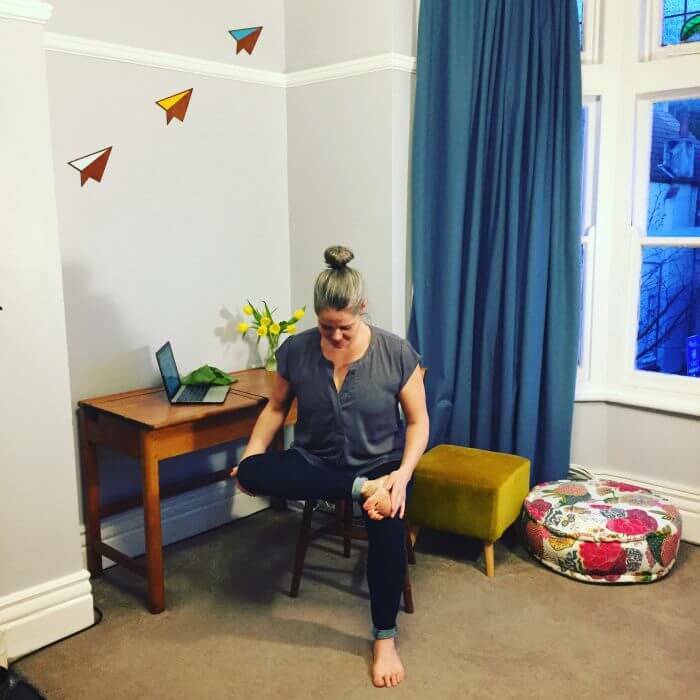 Active sitting for Core Engagement: with both feet flat on the floor, arch your back as far as you can, then round it as far as you can, then find the place between where you are in neutral spine and sitting straight up from your sit bones. 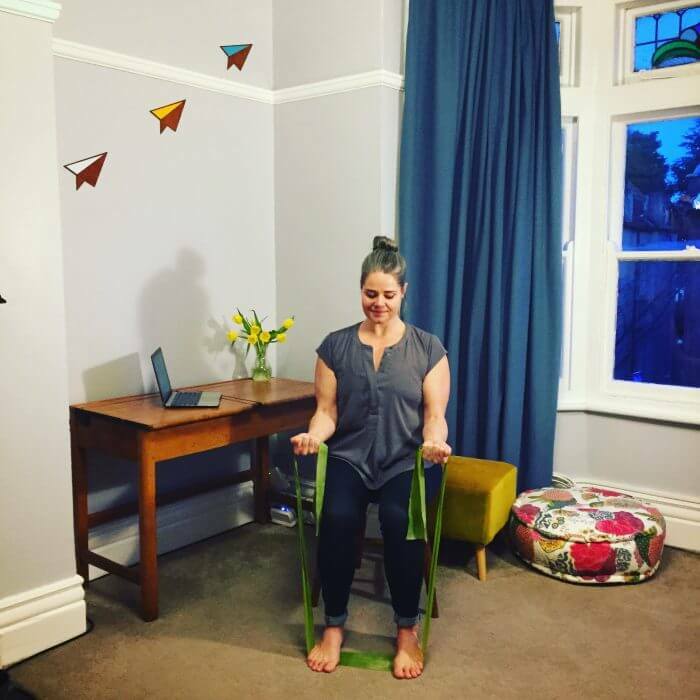 Press the sit bones into the chair and feel like a string attached to the top of the head is pulling the head and spine long, up towards the cieling. Press the muscles of the lower belly and the muscles of the lower back into eachother and then upwards. 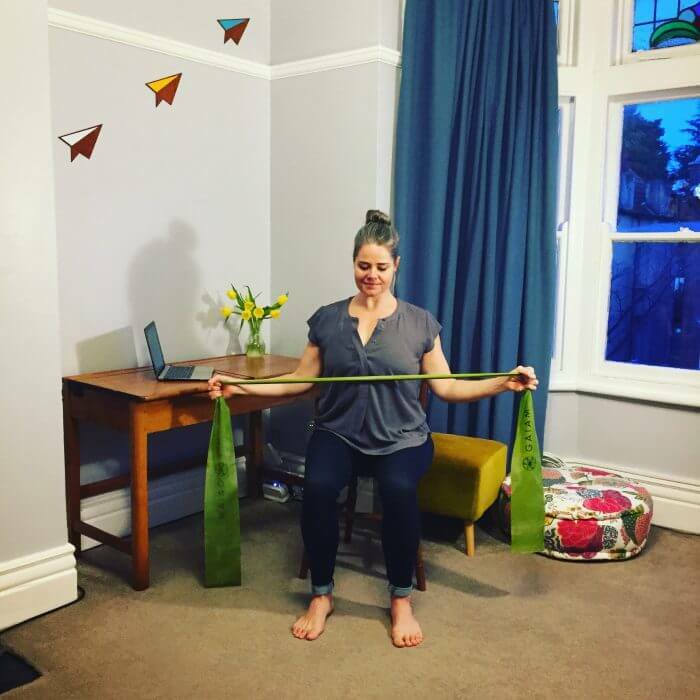 Lift through the pelvic floor. Imagine a corset tightening around your waist and lower ribs, drawing all those muscles also in and upwards to engage the TA muscles. relax the shoulders on top of this pillar of support. Think of your upper chest smiling to draw the shoulders gently back from the ‘computer hunch’. 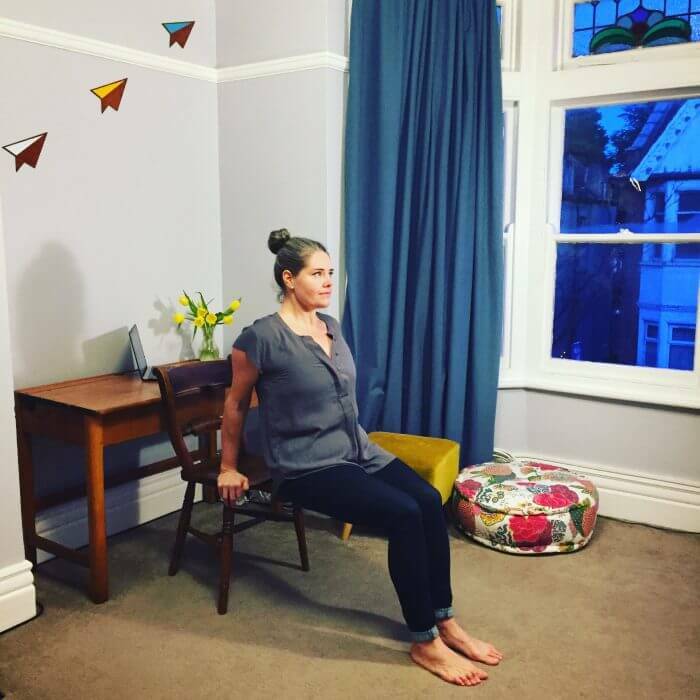 Seated core strengthening: Keeping this alignment lift one knee at a time towards the chest (you can use your hand to help if you need it). 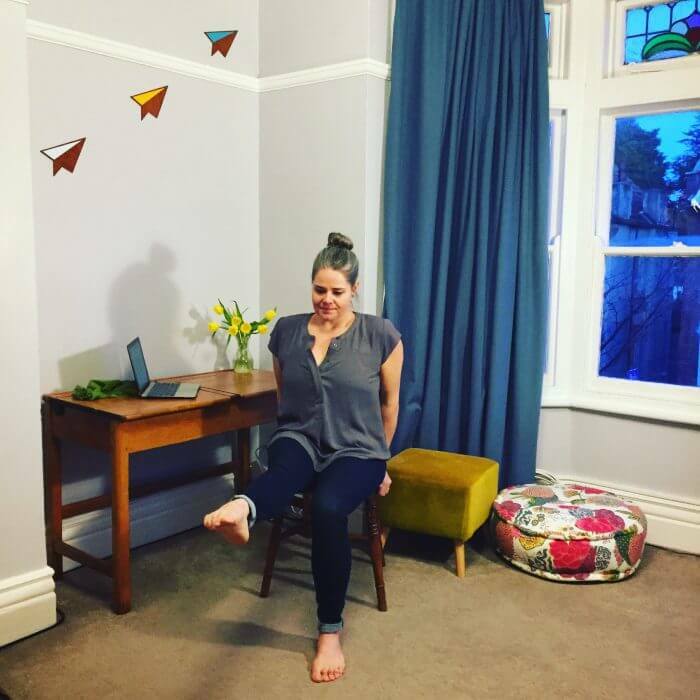 Then lower the leg slowly and just beefier the foot touches the floor, try extending the leg in front of you, point then flex the foot, then bend the knee to place the foot back on the floor. 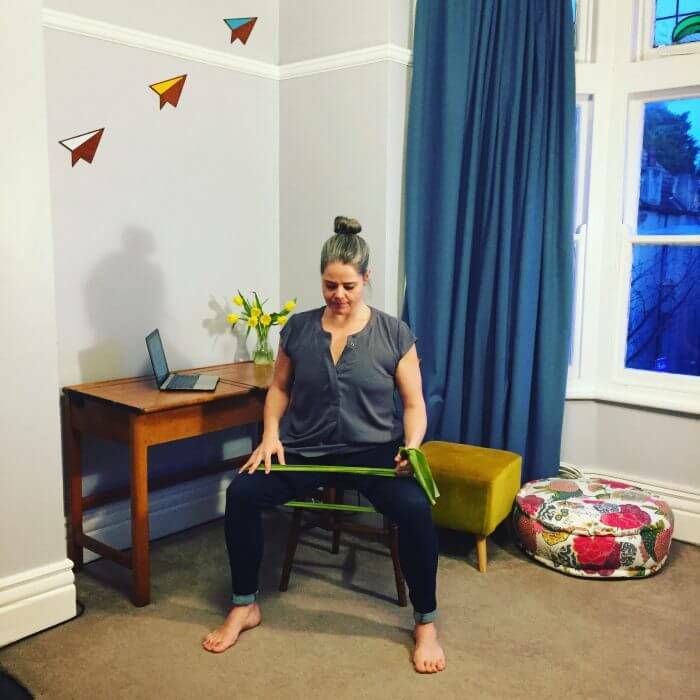 Seated Warrior 1: move the chair a little out from the desk. Turn so that one thigh and bottom cheek is on the front side of the chair and the other side is floating in the air. Lift through the lower belly and lengthen the spine as you send the other leg straight out behind you. Keep a bend in the back knee if you need to, you should feel a nice stretch in the hip flexor. 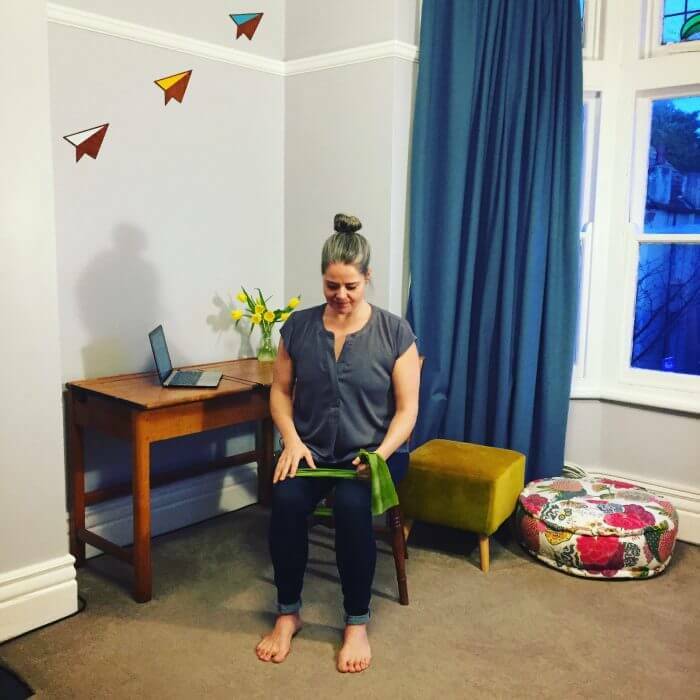 You are facing out over the knee that is on the chair, open through the front body as you reach your arms up. swap sides. Seated arm strengthening with theraband: If you have a resistance band you can do arm strengthening exercises from your seat. External Rotation: Keeping everything else still, lower ribs pulling in and core engaged, elbows by the ribs and elbows bent 90 degrees with band between hands, pull the hands away from each her – this movement should initiate from the shoulder joint. Bicep curls: put the middle of the band under your feet and the ends in your hands. Keep the elbows by the ribs and core engaged as you lift the hands toward the shoulders in bicep curls. You can extend this by adding and overhead press as well (stoping the lower ribs from flaring out at the top of the movement). 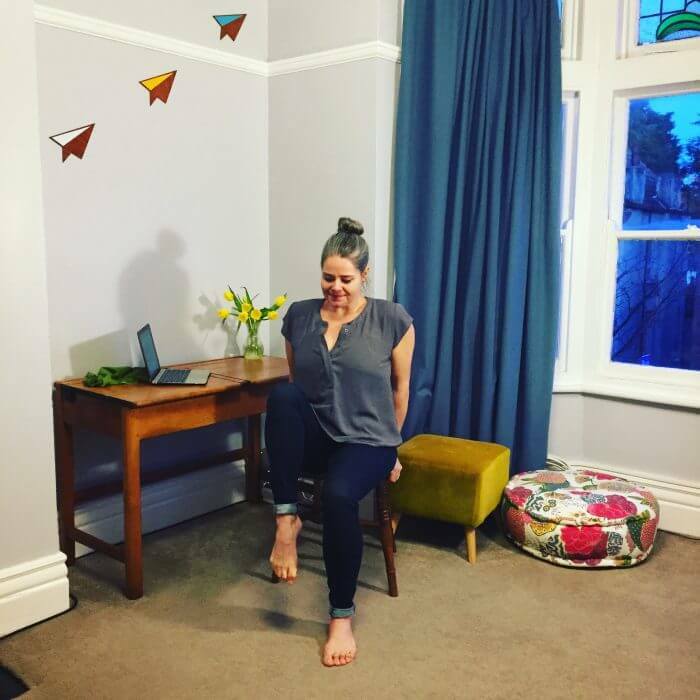 Ankle Lifts: Standing by your desk (you can use the desk or chair for balance if you need to) Rise up slowly to lift the heels off the ground and balance on the balls of your feet. Slowly lower. Make sure that you stop the ankle from tipping to either side, keep the centre of the ankle aligned with the middle toes. 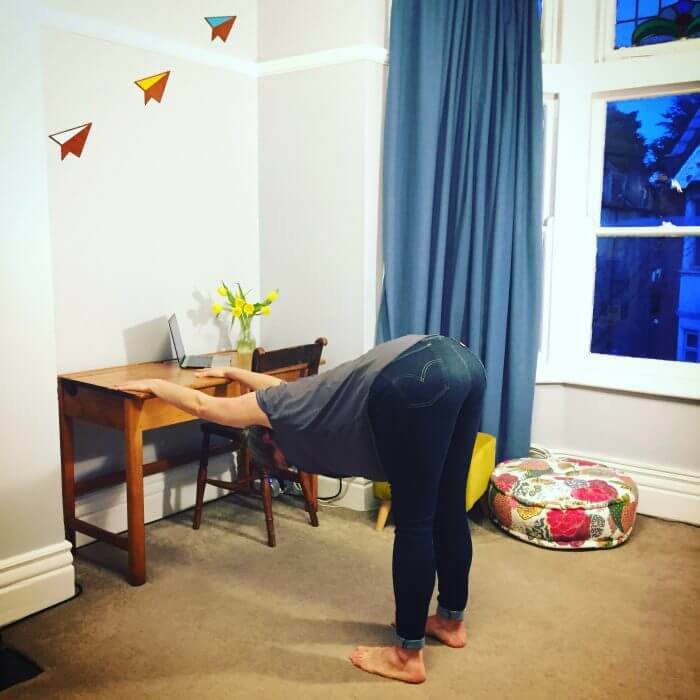 You can extend this by staying on tiptoes and squatting down, standing up again then lowering the feet. This exercise strengthens the ankles and helps with proprioception (balance and awareness of the body in space). 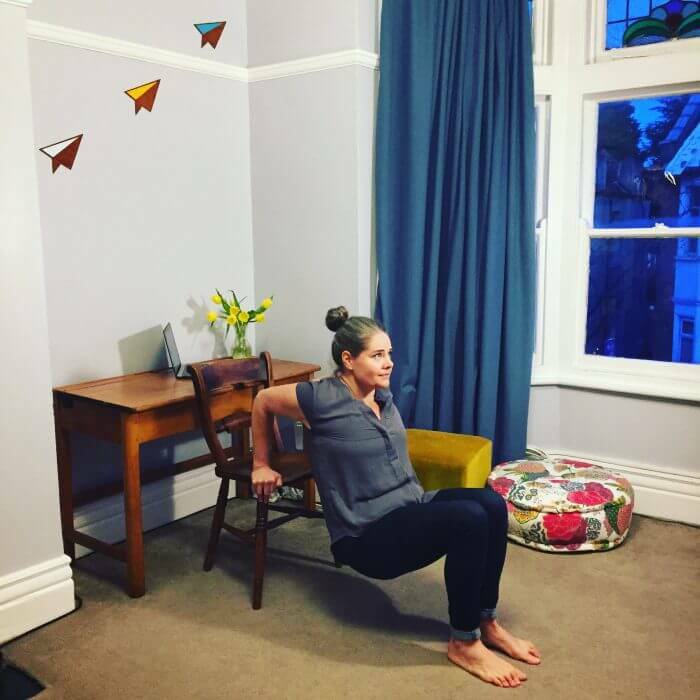 Chair squats or any style of squats you like: For chair squats, as slowly as possible, lower yourself to sit and stand again… engage your core, keep the knees tracking over the toes… maybe add a short hover just off the seat to build heat. You can take this further by doing regular squats away from the chair. Perhaps try one leg squats, bending one knee so you can place the foot on the chair for balance and a little support while you do standing 1 leg squats. 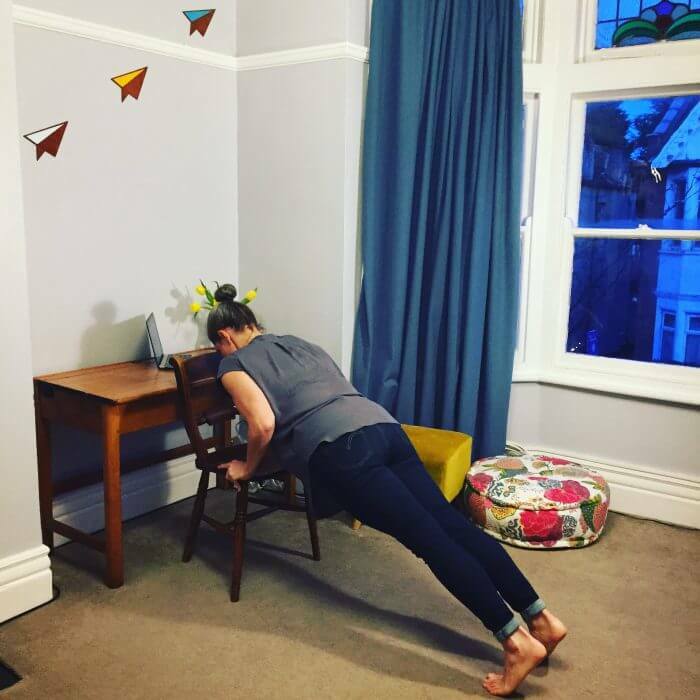 Pushups: Place your hands on the desk or chair for pushups (or just go for the floor if you have the space). I favour the style of pushups where you keep the elbows in brushing the ribs. Try to hinge at the elbow for the press ups, keeping the elbow aligned with the wrist. 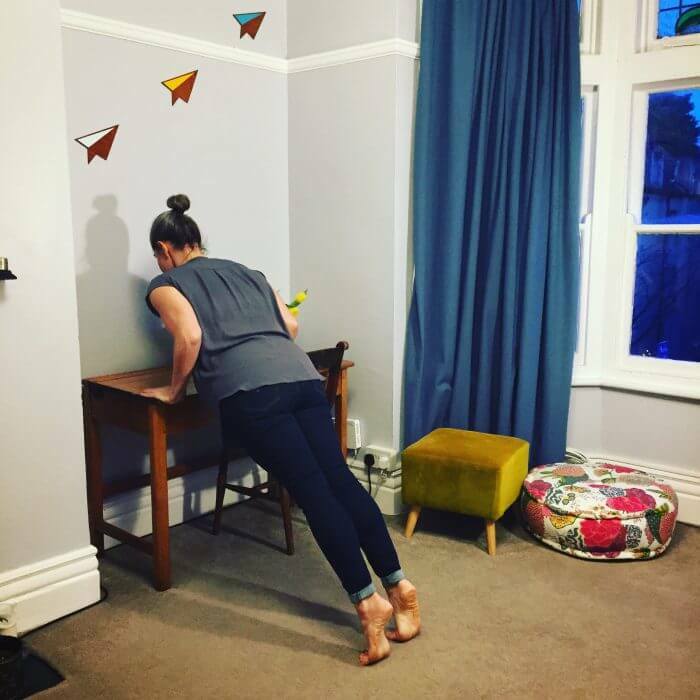 (you can extend this by lifting one leg or hand and trying for adapted pushups – or swap direction and put the feet on the chair and hands on the floor for more challenging plank or press ups). Dips: With your back to the desk/chair, place your hands on the desk/chair and do some dips. The further your feet are away, the more challenging. You can begin by keeping much of the weight in your feet and bending at the knee to allow the dip. Extend by taking the feet further away and keeping legs straight. 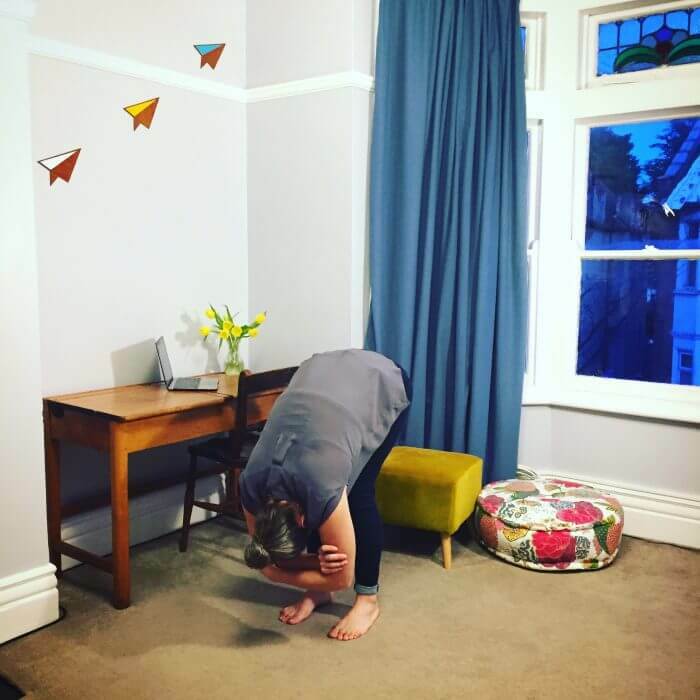 Cat stretch: put your hands on the desk and walk your feet back so you are in an L shape, with a right angle at the hips. Press down into the desk with your hands, and press the desk away as you stretch into the back, chest and shoulders. Then smile… take a nice deep breath… shake it out and drink some water… and enjoy some fresh energy as you dive back into your day. Strong Lady, Speaker & Producer. Charmaine has toured 22 countries since 2002 and performed in 6 languages so far. Her work is both skilled and funny, always created to entertain a wide range of audiences and theatrically crafted. She believes in the power of being on stage mixing strength with elegance and confidence with vulnerability. She invites audiences to celebrate who you are now... rather than waiting until you are perfect. Productions currently on tour: Strong Lady: Charmaine’s solo show as Betty Brawn - the strongest lady alive. GOP Variete Theatre: Charmaine features in ongoing seasons with the show ‘BackSTAGE’ touring to various German cities until 2018. As well as touring circus shows, Charmaine performs as an inspirational speaker for events and seminars. ‘Be the Strong Lady in your own Personal Circus’ combines experiences of touring the world as a strong lady with neuroscientific research, to explore mental ‘feats of strength’ that will help you to achieve the impossible... or the simple things in life. Charmaine studied theatre at university. She also trained in clowning, acrobalance, hand-to- hand acrobatics and physical theatre from various inspiring teachers around the world. She studied street theatre... on the street... with generous coaching from a handful of directors and performers but most importantly, from the audiences she shared her shows with. 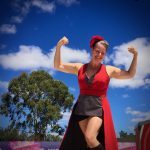 Charmaine is a passionate outdoor arts performer, with all her shows being created primarily for street theatre festivals and outdoor arts festivals. She also performs extensively in variety shows, and at events (from conferences and product launches to Christmas parties and even a wedding). There is now a full length theatre show in development as well! As well as self producing most of her work, Charmaine has been a festival producer for the Australian National Circus Festival, stage managed and production managed for venues and festivals, also tour managed for circuses and various arts organisations. Charmaine Childs is an Australian/British performer, speaker and producer. While she is based between London (UK) and Brisbane (Australia), she tends to spend most of the year on tour around the world. Subscribe here if you’d like occasional updates about blog posts, tour dates & exciting plans.